I believe that this guide was first published in an Australian Botanical and Horticultural Society Report, probably about 1850, but I don’t have the precise reference. 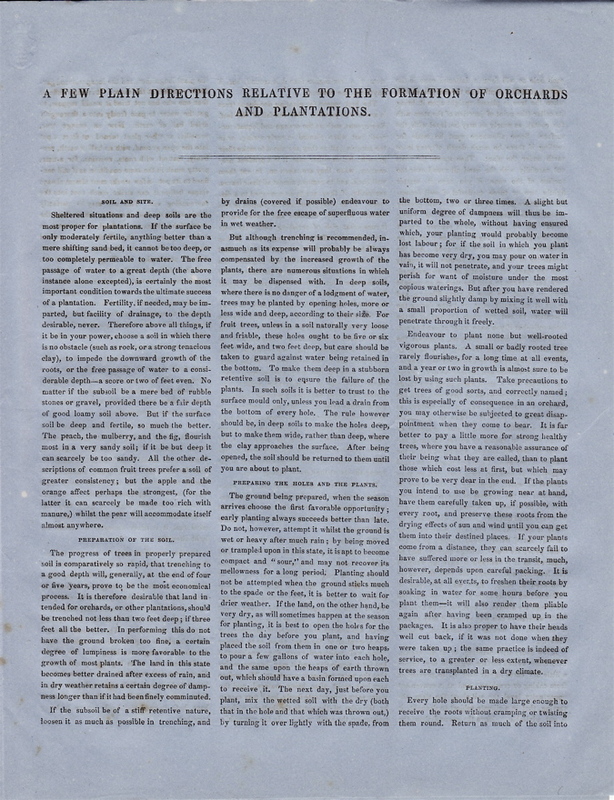 It was also published as a pamphlet, printed on both sides of thin, blue, high quality paper. 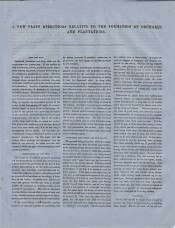 A number of these pamphlets have survived and are preserved in the Camden Park Archives. Sheltered situations and deep soils are the most proper for plantations. If the surface be only moderately fertile, anything better than a mere shifting sand bed, it cannot be too deep, or too completely permeable to water. The free passage of water to a great depth (the above instance alone excepted), is certainly the most important condition towards the ultimate success of a plantation. Fertility, if needed, may be imparted, but facility of drainage, to the depth desirable, never. Therefore above all things, if it be in your power, choose a soil in which there is no obstacle (such as rock, or a strong tenacious clay), to impede the downward growth of the roots, or the free passage of water to a considerable depth – a score or two of feet even. No matter if the subsoil be a mere bed of rubble stones or gravel, provided there be a fair depth of a good loamy soil above. But if the surface soil be deep and fertile, so much the better. The peach, the mulberry, and the fig, flourish most in a very sandy soil; if it be but deep it can scarcely be too sandy. All the other descriptions of common fruit trees prefer a soil of greater consistency; but the apple and the orange affect perhaps the strongest, (for the latter it can scarcely be made too rich with manure), whilst the pear will accommodate itself almost anywhere. The progress of trees in properly prepared soil is comparatively so rapid, that trenching to a good depth will, generally, at the end of four or five years, prove the most economical process. It is therefore desirable that land intended for orchards, or other plantations, should be trenched not less than two feet deep; if three feet all the better. In performing this do not have the ground broken too fine, a certain degree of lumpiness is more favorable to the growth of most plants. The land in this state becomes better drained after excess of rain, and in dry weather retains a certain degree of dampness longer than if it had been finely comminuted. If the subsoil be of a stiff retentive nature, loosen it as much as possible in trenching, and by drains (covered if possible) endeavour to provide for the free escape of superfluous water in wet weather. But although trenching is recommended, inasmuch as its expense will probably be always compensated by the increased growth of the plants, there are numerous situations in which it may be dispensed with. In deep soils, where there is no danger of lodgement of water, trees may be planted by opening holes, more or less wide and deep, according to their size. For fruit trees, unless in a soil naturally very loose and friable, these holes ought to be five or six feet wide, and two feet deep, but care should be taken to guard against water being retained in the bottom. To make them deep in a stubborn retentive soil is to ensure the failure of the plants. In such soils it is better to trust to the surface mould only, unless you lead a drain from the bottom of each hole. The rule however should be, in deep soils to make the holes deep, but to make them wide, rather than deep, where the clay approaches the surface. After being opened, the soil should be returned to them until you are about to plant. The ground being prepared, when the season arrives choose the first favourable opportunity; early planting always succeeds better than late. Do not, however, attempt it whilst the ground is wet or heavy after much rain; by being moved or trampled upon in this state, it is apt to become compact and “sour”, and may not recover its mellowness for a long period. Planting should not be attempted when the ground sticks much to the spade or the feet, it is better to wait for drier weather. If the land, on the other hand, be very dry, as will sometimes happen at the season for planting, it is best to open the holes for the trees the day before you plant, and having placed the soil from them in one or two heaps, to pour a few gallons of water into each hole, and the same upon the heaps of earth thrown out, which should have a basin formed upon each to receive it. The next day, just before you plant, mix the wetted soil with the dry (both that in the hole and that which was thrown out), by turning it over lightly with the spade, from the bottom, two or three times. A slight but uniform degree of dampness will thus be imparted to the whole, without having ensured which, your planting would probably become lost labour; for if the soil in which you plant has become very dry, you may pour on water in vain, it will not penetrate, and your trees might perish for want of moisture under the most copious waterings. But after you have rendered the ground slightly damp by mixing it well with a small proportion of wetted soil, water will penetrate through it freely. Endeavour to plant none but well-rooted vigorous plants. A small or badly rooted tree rarely flourishes, for a long time at all events, and a year or two in growth is almost sure to be lost by using such plants. Take precautions to get trees of good sorts, and correctly named; this is especially of consequence in an orchard, you may otherwise be subjected to great disappointment when they come to bear. It is far better to pay a little more for strong healthy trees, where you have reasonable assurance of their being what they are called, than to plant those which cost less at first, but which may prove to be very dear at the end. If the plants you intend to use be growing near at hand, have them carefully taken up, if possible, with every root, and preserve these roots from the drying effects of the sun and wind until you can get them into their destined places. If your plants come from a distance, they can scarcely fail to have suffered more or less in transit, much, however, depends upon careful packing. It is desirable, at all events, to freshen their roots by soaking in water for some hours before you plant them – it will also render them pliable again after having been cramped up in the packages. It is also proper to have their heads well cut back, if it was not done when they were taken up; the same practice is indeed of service, to a greater or less extent, whenever trees are transplanted in a dry climate. Every hole should be made large enough to receive the roots without cramping or twisting them round. Return as much of the soil into each hole as will form a flattened cone in the centre, at such depth from the margin, as will, when the tree is placed upright upon it, bring its collar (the point of junction of the stem with the roots), as nearly as may be, level with the surface. Some allowance must be made for settling if there be much depth of very loose earth under the plant. Then spread the roots out carefully with the hand all round over the surface of the cone; if you have it, scatter lightly two or three spadesful of well-decomposed manure over the roots, it will greatly promote the immediate formation of young fibres; but do not add too much manure, except you are planting orange trees, as it might be productive of more harm than good. Add the remainder of the soil, not thrown in roughly with the spade, but as lightly as it can be placed, care being taken to hold the stem in an upright position whilst the hole is being filled up, and to lift it up gently once or twice during the operation, to bed the roots thoroughly in the loose soil – but if you have water at hand do not, according to common practice, compress the soil about them with the feet, it is better to settle it down as will be described below, especially if the weather and the land be dry. Form the surface into a small basin about two-thirds of the diameter occupied by the roots, with the margin all round, as well as the bottom, as nearly level as possible. Take an old broom without a handle [a ‘witch’s broom’, composed of sturdy twigs, is meant here], a bunch of small branches or twigs, a tuft of rushes or coarse fibrous grass, either of these will answer, and lay it flat in the bottom of the basin. Upon this pour, in as rapid succession as possible, two, four, six, or more buckets of water, according to the extent of the roots or the dryness of the soil [the buckets used probably held about 2 gallons i.e. 9 litres of water], observe, that if it be naturally in a moist state, the weight of a very small quantity of water will sufficiently settle it down about the roots, more would be hurtful; but if barely moist enough to let the water penetrate freely, a large quantity may be required, as it is desirable to have the whole of the loosened soil around the tree thoroughly moistened at once. Rain may not come in sufficient time for its early growth, and repeated waterings are always, if possible, to be avoided. Well watered in this way at first it may endure a drought, of months in duration, without suffering. A few hours after planting, or at all events, before the wetted surface begins to dry, throw a little dry earth lightly over it, to prevent it from caking or cracking; and at a convenient opportunity level the soil about the stem, observing, that in a climate subject to drought, it is not advisable to leave the ground about the stem of a tree higher than it is around, but, if anything, the reverse. The best season for planting deciduous trees is as early as possible after the fall of the leaf. Evergreens, such as the orange and loquat, succeed best when planted in early spring, or in the autumn, just as they are about to make their growth; but in either case it is a prudent precaution, when they are taken up, to cut them well back, and to remove almost all their leaves, especially, if they are to be conveyed to a distance. If an evergreen tree be planted in this climate, with its branches and leaves entire, it runs great risk of perishing before its roots can strike out sufficiently to support it. If you could ensure that the air would be as saturated with moisture as it usually is in England, the removal of any large portion of its leaves might be improper; but we know from experience that here the atmosphere, which at the time of planting may be loaded with moisture, may, in a day or two afterwards, reach a degree of dryness utterly unknown in temperate Europe. So long as the leaves of the plant can freely absorb from a moist atmosphere, they will continue fresh, and contribute to the early growth of the roots, but the moment this moist atmosphere is converted into one of considerable aridity, the system of leaves becomes positively injurious, the moisture existing in the stem and roots is exhausted to supply the loss occasioned by such an extent of evaporating surface, and the leaves themselves wither, leaving the plant in a far worse condition than it would have been in, had they been removed, with the greater part of the young shoots, at the time of taking it up. It is therefore recommended that all evergreens (resinous cone bearing trees alone excepted) should be cut back very short, and deprived of nearly all their leaves, when taken out of the ground. When you are planting out evergreens or other plants from pots, which may be done with success almost at any season, there is another danger to be guarded against, the neglect of which very often leads to failure. A plant growing in a pot has a very considerable quantity of roots in proportion to the extent of soil it occupies. In dry weather this little ball of earth will become so exhausted of moisture, by the absorption of the plant alone, as to require being well moistened every day; neglect of this for a single day, and it may become so dry that the water refuses to penetrate. The surface may look moist after being watered, and the water seem to penetrate freely, but it may escape by the sides of the pot to the bottom, without moistening the earth within. In the meanwhile the plant languishes, and the inexperienced gardener wonders at the cause. It is more difficult than one who has not tried it would suppose, to get the water to pass freely into a thoroughly dried ball of earth. Now an orange tree, camellia or other plant turned out from a pot into the open ground, with its ball of earth, probably, matted with roots, remains, for a time, pretty much in the same condition as if still confined to its pot – a few weeks must almost always elapse before it can strike much root into the surrounding soil. This soil may be perfectly moist, whilst the ball of earth to which alone the roots of the plant are confined, may become, in a few days, so dry, that all the water poured upon it, to freshen up the plant, passes around, without penetrating it. To guard against this evil, it is desirable in planting out, to crack, by gentle means, the ball of earth in more than one direction, to form over it a very small basin, smaller than the ball of earth itself, and in dry weather to examine this ball every day, and to pour into the basin a small quantity of water as often as it my seem to need it, never suffering it to become dry. After two or three weeks the plant will probably have made sufficient fresh roots to dispense with this close attention. It is prudent, however, not to neglect the frequent examination of plants turned out of pots, or their balls of earth rather, until they begin to make vigorous shoots. It is a good plant to shelter evergreen plants of small size, by sticking into the ground around them, branches of trees with their leaves on. These fronds should be so inserted as not to extend far above the young plant, and should be placed thickest on the side from which most injury is to be apprehended from sun or wind. As soon as the plant begins to grow they may be gradually removed. It should be borne in mind that it is never desirable to exclude the light altogether. Another excellent plan is to cover the surface around plants, for a moderate extent, two or three inches thick with moist decaying litter. Besides preventing the escape of moisture by evaporation, it undoubtedly imparts some principle of fertility to the earth independently of what may be derived from the decomposing substances themselves. The ground amongst trees should be kept free of weeds by slight occasional hoeings, avoiding the use of the spade when the roots begin to spread around. Never crop with vegetables near a tree, it is far better to have your fruit trees and your vegetables quite distinct from each other, than to have both starved and badly grown by being together.